Oktopost provides a single platform for distributing content on a large-scale, using multiple social networks and profiles. The platform allows B2B marketers to see the actual ROI of social media, by tracking leads back to the exact social post they came from. With our industry leading integration, we are able to enrich your leads in existing marketing automation platforms (Marketo, Act-On, Eloqua etc. ), with a whole new layer of social data. Pros: Oktopost is extremely user friendly. Its easy to create, schedule and get social messages approved. Has some nice collaboration features, and the tracking is great. 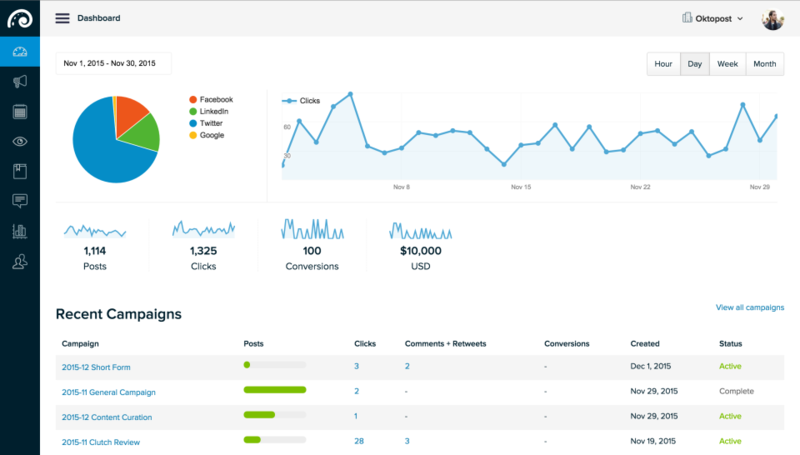 Allows you to pull analytics by tags, social platforms, users etc. Also has an amazing advocacy platform that integrates into the rest of your social plan and allows you great visibility into who in your company is posting and what their contribution is in terms of how much traffic you get. Cons: I find the feature of scheduling posts a bit annoying sometimes as things can get left in draft mode, and its not super clear until the day has come and gone and your post didnt go out. They also make you reconnect each profile every 3 months which can get tedious. Overall: Overall, I love using this platform and it makes my life so much easier. Comments: Strategic Internet Consulting have been using Oktopost for around six months to support social media activity in our Inbound campaigns. 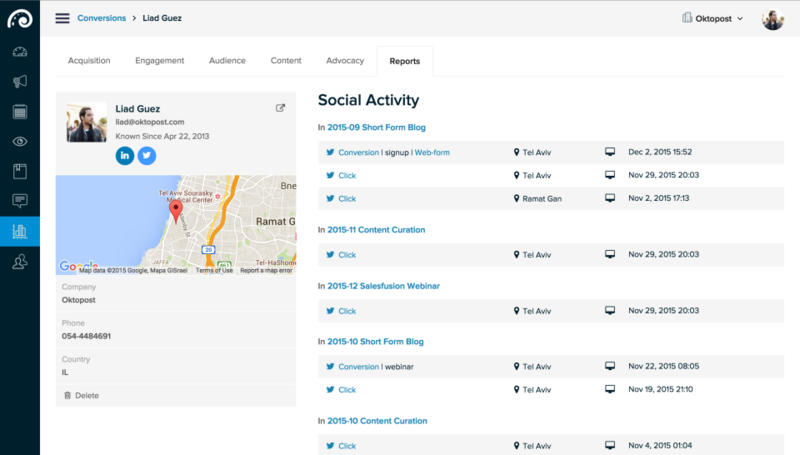 More comprehensive than simple scheduling tools, it was the social advocacy board that first drew us to the tool, plus HubSpot integration, and detailed reporting on social conversion. As an agency user, we're now Silver Oktopost Partners. Cons: In the future we'd like to see more segmentation on the leaderboard - by social campaign if possible, as not everyone in the business needs to post on all topics. Having the chrome app pull through images when sharing to twitter would be useful too, but not too big an issue! A paid ads integration might be asking a lot but would be interesting to see. Comments: Social marketing is difficult for our team because we don't often have huge amounts of time to spend getting campaigns up and running. We also need to find out how our campaigns performed - for both engagement and conversions. Oktopost allows us to deploy a fully scheduled campaign in about 5 minutes. 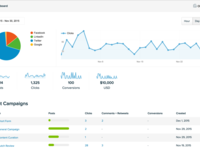 We can also see analytics for each and every campaign, across a whole range of KPI's and metrics. Reporting on our communications activities is now as easy as exporting a few PDF's. These aren't vanity metrics either, they are all tied to major business objectives. Oktopost also lets us monitor social in vertical streams, so we can follow our own feed and messages just as easily as we can monitor the competition, track keywords and identify conversation topics to join. The employee advocacy platform within Oktopost has also transformed how we communicate with our staff and they can now share our organisation messages from their own accounts and have it fully tracked and aggregated as part of a campaign. We can also curate content directly from Oktopost. This content can be directly assigned to a campaign too, which is measured in the per-campaign analytics. The campaign tagging is also fantastic, because we can run reports filtered by internal groups and communications objectives. Overall, we are extremely happy with Oktopost. The product is great, but the support team is even better. They are friendly, offered us a discount as a non-profit, and answer questions quickly. Pros: Ease of scheduling and editing. Cons: Wish it was easier to post to multiple networks with the same status at once. Overall: I really appreciate the ease of scheduling social posts in advance but I wish it was easier to copy statuses so I could publish to multiple networks at once instead of Facebook, and then Twitter, and so forth. Maybe you can and I'm missing how to do it but if that's true it's not intuitive. Pros: Their calendar/campaign feature is probably one of my favorite features. It's comprehensive and the color coding makes it super organized. I'm a huge fan of the image library that's included. 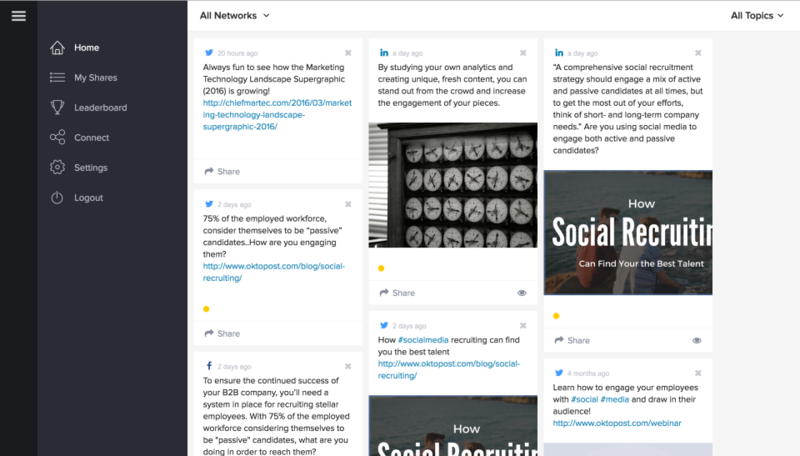 Additionally, we love this product for social employee advocacy. It has helped out employees become brand ambassadors and share content super easily to their own networks. Cons: There truly isn't much that I don't like about this product. The Salesforce integration works but unfortunuately we haven't been able to take advantage of it too much here. Overall: Social advocacy and easy social media management. Pros: I like the opportunity to schedule messages in advance and track the campaigns. My team consistently uses this function to have messages scheduled throughout the week, which in turn, works very well for our clients who depend on us for message and content promotion. Cons: The fact that I can't easily see who the followers are for each social network and have the ability to segment the audience. We would like to know if the followers we have are real or just bot accounts, or even more so, fake accounts, entirely. Having the audience segmentation would allow us to target specific message per network. Pros: Gives you a calendar view of all your posts, allows you to create 'campaigns' and tag them for easy filtering in the analytics section, UTM parameters & link shortening via the campaign, track unknown visitors until they convert, social advocacy component built in, curated content, Marketo/SFDC integrations. Also, a great and very responsive support team! Cons: Not much really. The new UI has a lot of great updates. The only thing I'd like to see more of are threads about how others are using the platform/how they set it up / sharing best practices and tips and tricks. Cons: Hardly anything tbh - i think the streams area could have top level tabs. For example I want to have 5 streams in the UK and then have the same streams in French etc. So the tool might need to be considered from a GLOBAL company perspective but other then that it is a perfect tool. Pros: The ability to segment posts by campaign and the approval workflow process. The UI is nice and user friendly, it is easy to onboard new contributors. Cons: Inconsistent support -- I used to hear from Oktopost a lot and responses were timely, lately I have not been able to get in touch with anyone and have a pretty pressing issue to figure out. Pros: This is a really robust platform that has truly been developed for B2B clients such that social stats integrate with marketing automation. The platform is really easy to use and has resources for just about every vertical you can use social to support. 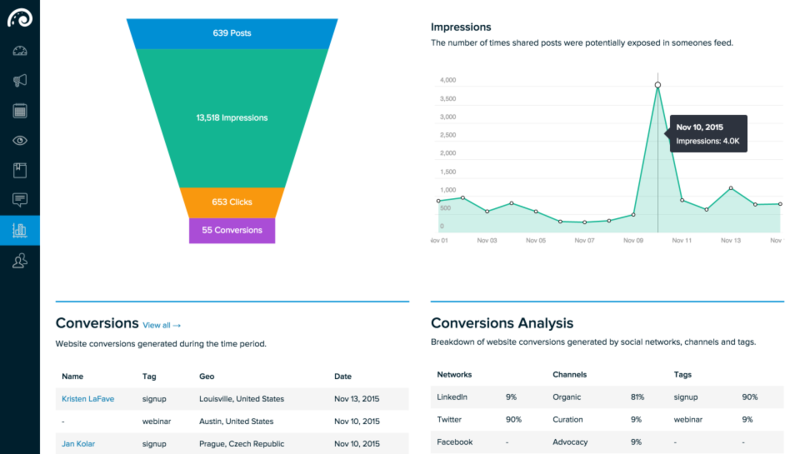 Tons of analytics insight for social that you don't normally see in these kinds of platforms. Cons: Using the platform to its fullest takes 2-3 hours of training with an Oktopost rep. That's more than any other scheduler I've used previously. Overall: We've tied our social media to our actual return on investment in campaigns and gained a ton of insight into the efficacy of our social in general. Cons: It would be nice to have a content calendar for advocacy posts like the regular posts. Overall: I've been using Oktopost for over a year and I'm happy with the tool. Customer support is quick and helpful. They communicate new features regularly. I don't have any compliants. Fantastic capabilities and workflow - UI/UX takes a little getting used to, but is manageable. Pros: Love the native tagging for Twitter content. The campaign org of all content should be the gold standard for marketing automation products. Best customer service team I've worked with to date - if they do not know the answer (which they usually do), they will go well out of their way to find it for you. Calendar view is a little less intuitive than I would like, but once you get the hag of it, it is head and shoulder above the competition (I find this view is often the most sought after by leadership or cross functional partners for visibility into the content strategy). Cons: Inability to copy posts from various listening streams to advocacy board without first posting from business account. Glitchy time zone settings. Inability to tag when purposing content for LinkedIn or Facebook. Pros: I am a big fan of the overall UI. The Advocacy Board feature has been instrumental in helping us grow our social media reach. The robust Analytics view helps make reporting on results that much easier. Cons: I think making the Calendar view contents be drag-and-dropable would be amazing. The social board expiration date resets when I go back to a piece of content I saved. Overall: Has been a massive step up from other tools we have used! Integrates with Marketo and Salesforce to give our sales team greater insight on what prospects are engaging with, and helps us attribute MQLs back to social media. 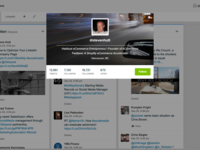 Love the employee advocacy functionality too. Thanks for the great review! Always great to see that our users love the platform. Pros: Oktopost makes the life of a social media manager so much easier. Beyond making scheduling and advocacy incredibly simple, I appreciate the integrations available and the amount of data and analytics that come with the platform. Cons: No complaints. Oktopost has made social so much easier! Oktopost is easy to use and intutive. Pros: Oktopost makes advocacy and social media management easy for our organization. It's easy to post updates to all our channels and to have employees repost. Cons: The dashboard and Manage post icons are different and it's confusing which one to operate from as both an employee advocate and a social media manager. Pros: The ease of use, kind of analytics it provides. Cons: There are certain limitations but that's fine, no tool can provide everything. Overall: We are using this tool since almost a year now, and our experience has been very nice in terms of getting onboarded, using the tool day in day out and the customer service provided by the Oktopost team. Pros: Good tools and integrations with all major social media platforms. I used this for a time at my last company and it went well. Easy to schedule things and do things, managing all your company social media posts. Cons: Not much. 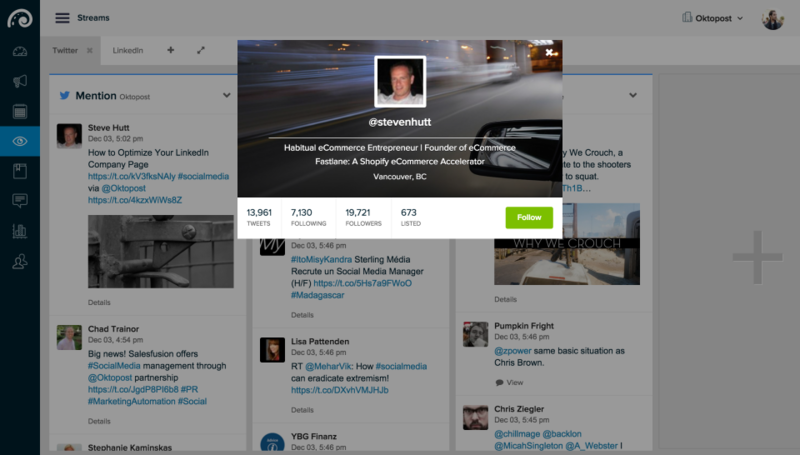 It's a fairly robust software, and improves upon Hootsuite and others. If you aren't using HubSpot or another bigger software with social media integrated already, you could get this and feel good. Overall: I liked the experience. I thought that it was easy for me to get started, get things working and get our social media handled. We left only because we got HubSpot and it already had social media tools. Cons: That you can't use Instagram with it. Overall: Oktopost is a great tool for us to share info across our social channels and track who is viewing what. Recommendations to other buyers: Take the time to thoroughly review the analytics once a week. It really helps your future social media efforts. Comments: Oktopost is a great tool for managing your social presence. It helps you in numerous ways: discovering relevant content, monitoring social media, posting of content, etc. Easy to use and with lots of reporting, oktopost is an invaluable tool for any company that takes social media serious. Cons: Nothing much. The fact that Facebook and linkedIn have taken away the possibility to post in groups is a bummer. Really good packaging of offerings -- scheduling, analytics, advocacy, campaign management -- all great. Cons: Advocates wish they could schedule their personal tweets beyond just what's been posted to the board. Streams could use some refinement -- it's the one area I struggle to figure out. Scheduling social media posts has never been so easy! Pros: I like the easy way I can schedule social media posts on the B2B platforms that I use the most. There are a lot of easy tools to make the scheduling consume as little time as possible. Cons: It's a very feature-rich product. Instead of just being signed on, I would have loved more introductory assistance and insight so I could see the tool's many features right away. I don't really know just where I need to go for help. Recommendations to other buyers: If you are a visual person like me, I need the color-coded campaigns and calendar view to see what is happening and when. Pros: The calendar feature is my favorite. I love that all my campaigns are color coded and posts can be dragged and dropped into a new date if necessary. It helps keep me organized and I can see exactly how many posts from each campaign are being scheduled. Cons: I'd love to see Oktopost increase their listening tool to include FB messenger, Instagram, and posts/comments that were not sent through the platform. Overall: Employee advocacy is fantastic! Pros: It's nice to be able to schedule my monthly posts and then not have to think about it again. Cons: You can't tag scheduled facebook or linked in posts for some reason. You can only do that for twitter. Also, if you do a hyperlink, you can preview it. Cons: We needed a little bit of help understanding how the posting process works but this was only because it w as a different system to our previous social media management tool. Overall: We have just started using Oktopost and can't believe how much easier it has made our social media management. The bulk upload feature is perfect for scheduling multiple messages in advance and we're really looking forward to using the employee advocacy feature. Recommendations to other buyers: Really worth the money. Pros: It was easy to use and a really great social medial tool. Cons: Sometimes, it was not very customizable. Comments: Oktopost is superior to its competitors, in part because the social media tools it provides align so closely with what B2B marketers are looking for. When marketers utilize Oktopost's social media marketing platform, they don't have to guess whether their campaigns are working or estimate the value of their efforts. Oktopost provides its users with quantifiable data that they can use to justify their programs. The platform's auto-posting and advanced message scheduling features help marketers save time, while the advanced analytics and straightforward interface make it incredibly easy for new users to get started. Pros: Ability to autopost on LinkedIn groups is useful for B2B marketers. Comments: This tool is very useful if you're looking for a scheduling platform for most important social platforms: Facebook, Twitter, Google+ or LinkedIn. 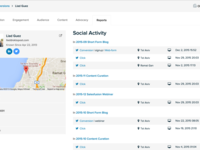 It also allows you to track campaigns, and create a content calendar. Everything is one place where you can see what you've scheduled on which channels for which days. Comments: We recently decided to swap our social media platform to Oktopost. While they have many similar features and capabilities as our existing platform, they had some really cool new features that I can't wait to explore. The idea of an advocacy platform is amazing for a B2B organization that's teaching employees to be social sellers. Their analytics platform far outpaces their competition and their scheduling platform is amazingly easy to use. Their queueing capability is something that makes my life so much easier! I'm really excited that we made the decision to swap vendors. Next on the list is the Marketo integration! Pros: This is a really great tool for smaller scale social teams that do not need super detailed reporting metrics. I loved the calendar view and being able to create and report on campaigns. 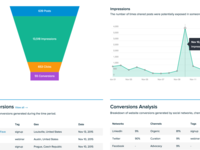 Cons: The metrics for reporting is nowhere close to Oktopost's large competitors like Hootsuite. And it is not a great tool for global social teams. Pros: This product is geared toward B2B companies. And their analytics are great for measuring real impact from that perspective. Recommendations to other buyers: Check out the employee advocacy tool. It has been instrumental in getting my employees active on social and sharing our content. Overall: Oktopost is easy to use and lets teams coordinate on messaging. It has some nice features like drag and drop on the calendar to move posts around easily. Only complaint is that the messaging about profiles expiring and how to troubleshoot/fix them is a little confusing. That said - customer service called me and helped me sort it quickly. Comments: I've used a lot of social posting tools while managing social media in various jobs. Oktopost stands out as one that is easy to use and the customer service is wonderful! They are so quick to get back to me and my team if we ever have a question about the features and/or best practices. Pros: The best part of Oktopost is the tracking / tagging of posts within campaigns - that gives you excellent data and sorting when you're looking back on past posting. Overall: I came into my position as social media manager at a company that was using Oktopost and unfortunately it didn't fit our daily needs. There are some positive features that help it stand out against the competition but ultimately we went in a different direction. Comments: While a little pricier than some of it's competitors, it's worth it. Pros: Campaign management, scheduling and content library/duplication are all fantastic. Cons: Higher priced than other solutions. Comments: I've been using the application primarily to distribute content to dozens of groups simultaneously on LinkedIn. Oktopost is a fantastic solution for achieving this. I recommend the product for social media managers who are looking to increase efficiency and receive real-time analytics on the posts. Oktopost is nicely designed and has excellent customer service, it's a solution worth considering for your social media manager's workflow. Pros: It gives really informal yet valuable information. It is helpful in my companies business to business marketing strategy. Cons: I wish there was more content delivered to my email box, possibly every morning. A totally weird thing to like least, but I find it super helpful as I grow myself as a young individual in marketing. Comments: I really like the OktoBlog Weekly. I find the information to be very relevant and easy to digest for someone who is not a social media expert. It definitely helps me be better at my job because I can speak more intelligently to our Social Media Manager when requesting assistance on a campaign. Comments: I became introduced to Oktopost when our marketing automation platform, Salesfusion, launched the integration. Oktopost has been very helpful in getting our staff to use social media. I like the attribution metrics that allow us to track ROI of social media efforts (and the integration with Salesfusion is the real value add for us). I also like that the Oktopost team is always improving their product based on actual user feedback. My experience with everyone on the team has been pleasant. Pros: I'm not a paying customer of the software. I do however recommend the newsletter. Cons: I'm not a paying customer of the software. I do however recommend the newsletter. Overall: I've been a subscriber to the Oktopost newsletter for a while now. The content they deliver is always interesting and relevant to my interests'which includes B2B marketing. Subscribe for their newsletter. You won't regret it! Comments: This product doors everything it put promises and much much more. I highly recommend checking out the company and its products. Cons: There are a couple of things that cannot be done with the software, so we do it on the platform themselves. Comments: I trust Oktopost and it is one of the "tools" for B2B Social Media Management Platform. Must have Oktopost. Comments: We are satisfied with the system. The only thing we could criticize is that we get too much e-mails. It would suffice to receive a maximum of 1-2 per month. 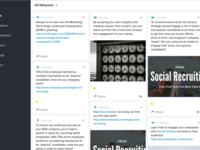 Pros: While searching for a software to suit our needs, we looked in to Oktopost for its social media management capabilities. Although it offered some great features, we found other options that could offer the similar options for a much lower price. Cons: We found that the software features available through Oktopost were also available from other software providers at a more affordable cost. Perhaps some of the other features might be worth the extra expense to others. Comments: The best tool I've found for my company's social media marketing. A+. Comments: The most useful marketing App I have seen this year! Comments: I have used oktopost just during the holidays absence of my Social Media colleague on the department. It looks easy but I cannot give a detailed opinion.